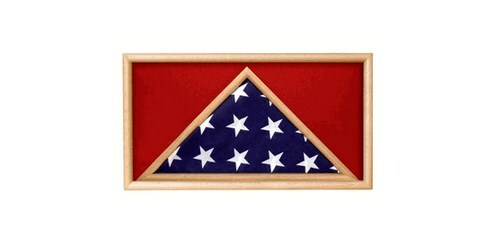 The perfect size case for displaying two flags, if you are looking for the perfect Marine Corps Retirement Gift. 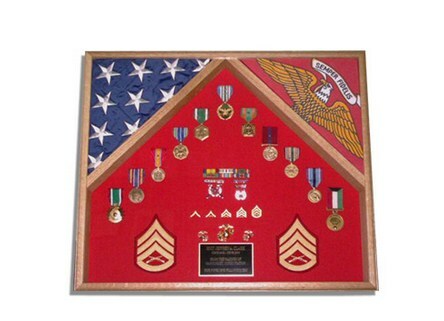 The marine Corps Retirement Flag Case is perfect size case for a ample amount of memorabilia, designed to sit on a desktop or shelf. 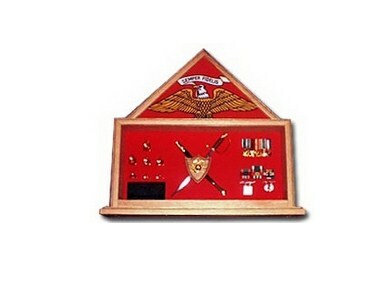 US Air Force, US Army, US Coast Guard, US Marine Corps, US Navy Deluxe Combo Awards / Flag Shadow Box. 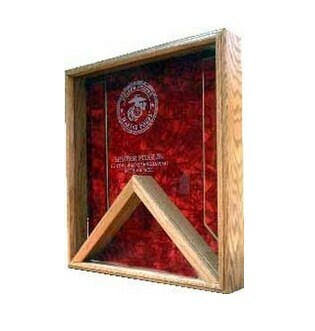 This Marine Corps Flag Box – Shadow Box is made from solid hardwood, providing an excellent display for rank insignia and medals with a flag case triangle in the upper left corner, which holds a 3ft x 5ft flag (purchases separately). 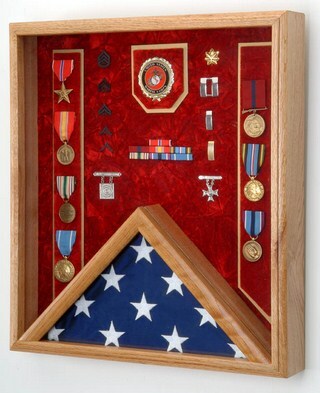 Made exclusively for memorializing the U.S. Navy flag, this Shadow Box measures 18 in. x 20 in. (H) x 3 in. (D) with raised mounting surfaces. 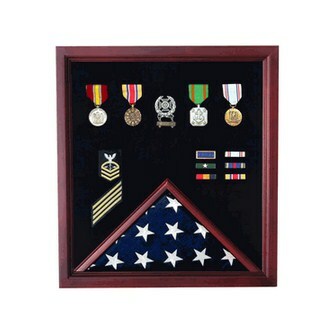 Constructed of only the finest solid oak or walnut, the Navy Flag Display Case has a laminate panel back with hanger, an embossed 2 ½-in. service emblem, crushed velvet background and a glass front. 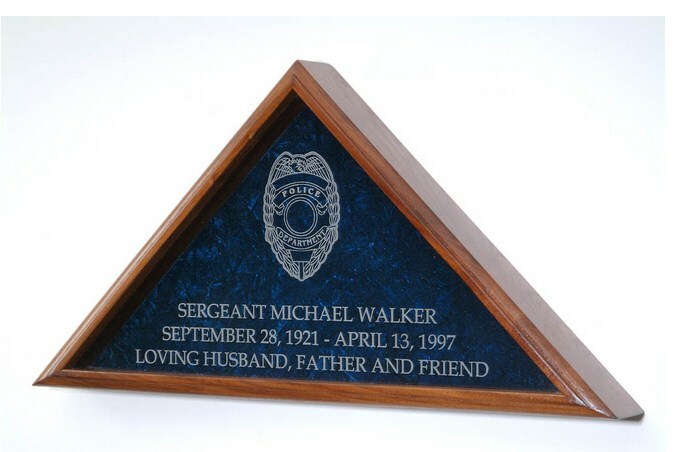 Optional personalized laser engraving is also available. Our Medal Display Case compliments our flag Cases. Available in Heirloom Walnut or Cherry finishes. Glass front, black Velcro™ insert including Velcro™ tape & instructions for easy mounting. Opens from back with turn button closure. 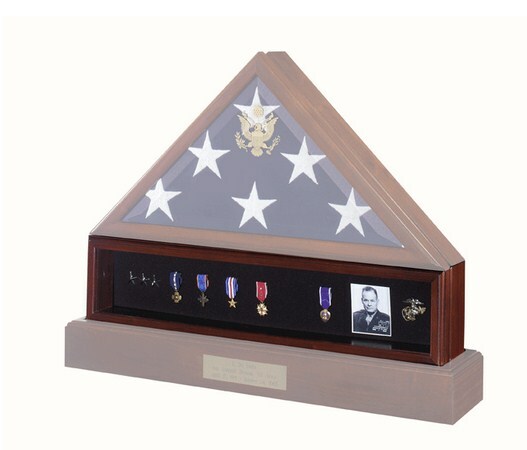 This Rectangular Flag Memorial Case is hand crafted out of solid oak that has a high gloss finish with a lightweight acrylic front panel. 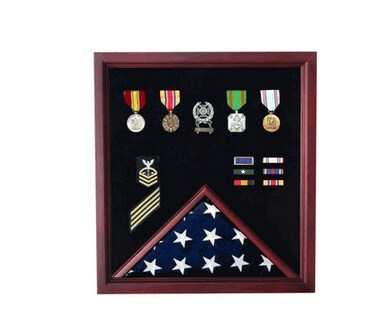 This beautiful case is perfect for displaying your special 5′ x 9.5′ flag and any other memorabilia, such as medals, rank insignia, patches, pins and more. Included are a wall hanging kit and complete care instructions. You may also add an engraving plate that you may mount wherever you like on the case. You can either choose black on brass or plain brass and they are engravable with up to three lines of 25 characters each.